When you think of vitamin C, you’ll probably conjure up images of oranges, lemons, or chalky, chewable tablets marketed as an immunity-builder since the beginning of time. It’s common knowledge that vitamin C is vital in nutrition for health and wellness but, not so well known is the fact that it’s also a crucial ingredient in your skincare. The scientific truth is that when applied topically, natural vitamin C repairs and regenerate cells, reduces fine lines and wrinkles, stimulates collagen production, acts as an anti-oxidant to protect skin against further damage, and will leave your skin looking clearer and brighter while fighting the visible signs of aging. The body is unable to produce vitamin C by itself which is why it’s essential that it’s regularly applied directly to your skin if you want to harness the power of one of the most effective vitamins in the world. If you’re thinking about checking the labels on your moisturiser to make sure your skincare contains, what we believe, is an essential ingredient in any skincare product, the ingredients list on your products isn’t quite as transparent as your juice carton with a picture of a great big orange on the side, so you need to know what to look for. Vitamin C is a highly unstable vitamin so changes to its environment caused by extraction (such as temperature and light), will inevitably reduce the effectiveness of the miracle nutrient, and fast. Therefore, to maintain its current (and effective) form once it’s extracted using traditional methods, it needs additional synthetic stabilising ingredients to keep it constant. The benefits of vitamin C lie in how the natural serum is extracted from its source. As a water-soluble vitamin, the big C in its natural form is highly unstable and will only last approximately half an hour in any water-based solution (an ingredient that you’ll find at the top of the list on most, if not all, of your cosmetic products). For it to remain stable in cosmetic products, stabilising synthetics are essential to help vitamin C retain its structure. Because it’s a natural product, humans can’t manufacture vitamin C in its pure form; it can only be manufactured in its oxidised form which you might see written on your labels as ascorbic acid. Natural vitamin C and ascorbic acid are NOT the same molecule, but because of the instability of natural vitamin C, consumers are left with a shelf full of products that contain the ingredient ascorbic acid (synthetic vitamin C) but which are boasting the anti-oxidant benefits of natural vitamin C.
It must be noted that all data relating to the benefits of vitamin C is in response to studies carried out on the pure fruit vitamin and not on ascorbic acid. But, as you now know, they’re different. If you’re invested in the quality of your skincare products, it’s essential you now understand WHY they’re different, and for this, we must get scientific. ALL (not some, ALL) of the anti-oxidant properties that natural vitamin C is renowned for are contained within its double-bonded oxygen molecule. It’s this part of the vitamin C structure that makes it unstable and is the reason it can’t be manufactured synthetically. Humans cannot replicate the environment that nature has created to produce this incredible active. Essentially, synthetic ascorbic acid which, while it can carry the loose description of ‘vitamin C’, contains NO anti-oxidant properties because the double bonded oxygen molecule has been removed to keep it stable, and therefore none of the benefits to your skin that you’ve paid for. This is important information so I’m going to repeat it so it sinks in like Biologi plant serum on a freshly cleansed face. Synthetic vitamin C (labelled as any of the names listed above) has NO benefit to the skin whatsoever and does not provide any anti-oxidant potential. The likelihood is that while you’ve made every effort to put cell-loving Vitamin C-based products on your face and body and you should be applauded for doing so, clever marketing can almost certainly guarantee that your skin has never had exposure to natural, active vitamin C. Ever. If you’ve ever questioned why your vitamin C-based products aren’t working, this is the reason. But it’s not all gloom and doom; there is a way you can get natural vitamin C that your cells will thank you for onto your skin. 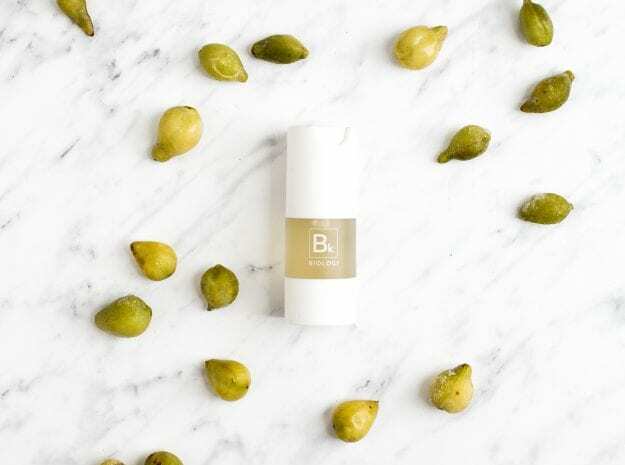 Biologi has developed a world-first, unique extraction method which ensures that the vitamin C found in the Kakadu Plum and Finger Lime plant remains stable and active once extracted. We don’t mix diluting agents like water with our serum, we don’t add activating agents, and we don’t have an ingredients list, all our serums contain just one natural extract. When extracted in this unique way and used daily, natural vitamin C will leave your skin looking bright and luminous. Vitamin C can be found in high potency in both our Bk + Bf serums giving your skin everything it needs to protect it from environmental damage, free radicals and reduce fine lines and wrinkles. If you’re still unsure what you should look for, you need to see natural vitamin C from the source. If it’s diluted, synthesised, altered, or manipulated, vitamin C will be ineffective in skincare. And that’s science.